If you're visiting New York City but want to plan an excursion to Washington, DC, there are a variety of pros and cons to choosing the various transportation options between the two. Whether you're thinking of flying, driving, taking the train, or riding the bus, we've weighed out your options so you can make a decision based on what you want out of your trip. While a day trip to Washington, DC is technically do-able, it may be too ambitious if you actually want to get in all the sights and experiences of these two places. As a result, we'd recommend spending at least one night in each to make travel worthwhile and enable yourself to really get a taste of what Washington, DC has to offer. Additionally, check out some of the options we've listed below for one-day tours to Washington, DC from NYC if you'd prefer not to do it yourself and want a guided way to see both of these east coast cities in one trip. Traveling to Washington, DC from New York City by train is a quick, low-stress option that often offers comfortable seating with in-seat power outlets. Additionally, trains travel directly from Penn Station in central Manhattan to Union Station in Washington, DC, allowing visitors quick access to both city's central areas of tourism. Times vary by the number of stops by each service, with Acela service taking less than three hours and other trains taking about three-and-a-half hours. You can purchase tickets in advance on Amtrak's website or in person at Penn Station. Although it might take a little bit longer, bus service from New York City to the nation's capital is a cheaper yet still reliable option. Trips take about four-and-a-half hours but can be longer depending on traffic. Only Greyhound departs from within Port Authority Bus Terminal while other bus services depart curbside at different venues across the city. Among the top services between the two cities are Bolt Bus, Greyhound, and Mega Bus. That said, shuttle flights from New York City to Washington, DC can be cheaper than the train and run frequently—you just might have to factor in an expensive cab ride from Manhattan to one of the airports outside the city. However, Reagan National Airport (DCA) is the closest and most convenient airport to downtown DC. 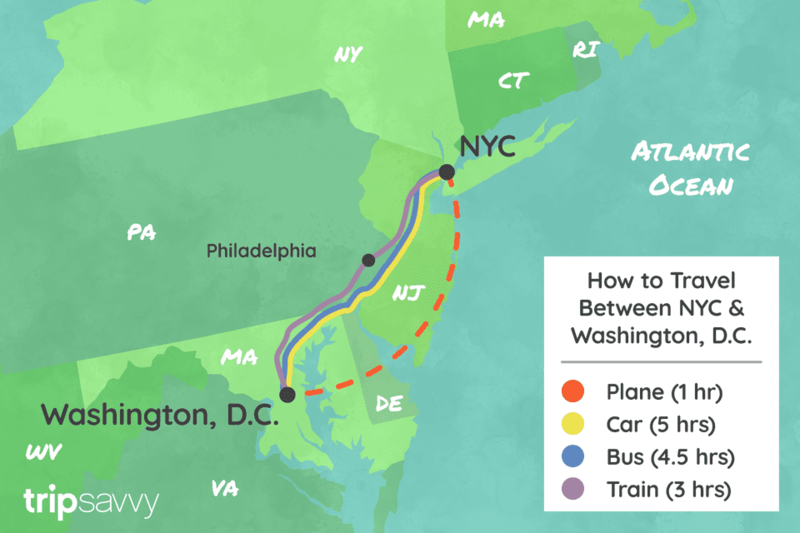 You can certainly rent a car to drive from New York City to Washington, DC as the route is fairly direct along I-95. However, it doesn't make a lot of sense for most visitors because there's really no need to have a car in either city and parking can be troublesome. If you do rent a car, plan on about five hours of travel time, though stops and traffic will add to the overall time. You can rent cars in Manhattan, though rates at the airports outside the city tend to be cheaper. Newark is a great place to rent a car so that you can avoid the tolls getting out of the city on your way south to DC. If you don't want to travel to the nation's capital alone or don't know what to do once you get there, you can access a number of self-guided and guided tours of Washington, DC by bus companies and travel websites. If you purchase the "Washington, DC by Train from Viator" package, you'll get access to a self-guided tour that includes train travel to DC, a food court lunch, and a hop-on-hop-off tour of the city. The Washington, DC Bus Tour from Gray Line is a two-day guided bus tour that includes admission to Madame Tussaud's wax museum as well as the chance to see many DC landmarks and attractions.